I first came across The Self’s Titled CD when I was holding down a regular spot as an announcer on the (sadly missed) SCALA radio show. Each week I would pore through the SCALA music library, looking to create an interesting playlist that managed a blend of familiar tracks and little-known gems. If I remember correctly, it was Catherine Blanch who have me the lead on The Self, which I duly found in the library. 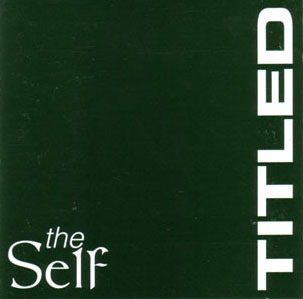 The Self was a project largely of Fred Chiapolino’s making, although he is ably assisted on this disc by the other members of the band - George Will (bass), Darren Young (lead and rhythm) and Renald Forsaith (drums and percussion). This album, the only offering from the band, is a collection of eight songs. Some of the songs grew from late night/early morning sessions at Ren’s place where the nascent band would “jam out till the early hours with a tape going”. Five of the songs on the CD were written by Fred in isolation, and he shares the songwriting credits on the remaining three tracks with other members of the band. I asked Fred what the album was about. The CD opens with Band Wagon Blues. The foot-tappin’ harmonica that leads us into the song soon gives way to a much tougher riff, and we are underway. The track is one of Fred’s favourites. “Band Wagon Blues was a swipe at the Green movement at the time”, he says. The line “running through the city naked like a jay bird just to protest” was a reaction to actual events - “they had a nudie protest up at Pine Gap”. Track two is a seemingly sympathetic look at Robert Maxwell and serves as a statement about how the media, and the public, create caricatures of people that have little or no grounding in reality. The song is built around an interesting rhythm and, I suspect, came out of one of the Self jam sessions. A well-placed dirty guitar solo provides an extra dimension. Last Breath features a staccato rhythm, frantic vocals and some wailing lead. It will wake you up and tire you out at the same time. For some reason, it reminds me of Adelaide’s more musically aware new-wave bands of the early/mid-1980s. Vanish in the Dust, You’ve Got to be Joking and Matters of Interest offer a similar lyrical sentiment. Vanish in the Dust remains one of Fred’s favourites and is helped along by guests Stuart Day on mandolin & violin and Tony Doyle on tin whistle. The harmonica makes a comeback in You’ve Got to be Joking, a song that motors along quite nicely, thankyou. Matters of Interest reminds me musically and vocally of John Lennon’s Cold Turkey but that probably says as much about me as it does the song. The album’s last track, You Might Think I'm Dreaming, is a beautiful melody and arrangement, lulling the listener into thinking this song might bring some kind of lyrical resolution to the CDs content thus far. Not so. This is Fred’s picture of what happens after the blast, after the apocalypse. We are listening to the last few futile breaths of one man; quite possibly the last breaths of the whole human race. Still, we won’t let the sombre mood get in the way of a nice tune, will we? You Might Think I’m Dreaming is a brilliant song, and a perfect closer. The prevailing mood of the CD is that the world is crazy, and it doesn’t seem to matter that most of us know this. The songs speak to me about the little person’s efforts being nothing more than futile, and that humanity’s future (or lack thereof) is all but assured. Lyrically, we hear of meaningless attempts at token protesting, of greed, and of dissatisfaction with the futility of it all. Musically, the songs are generally upbeat, harder-edged, bluesy sounding pieces, with one notable exception. Shortly after releasing The Self - Titled, Fred found that the band was running out of legs. Before he knew it, the band was no more. What do you do with surplus CDs? A couple of hundred were distributed to SCALA members with their regular copy of SCALA News – a novel, if not particularly lucrative, way of getting heard. And what of Fred Chialpolio? These days, Fred is in Canada, playing music and having a blast. The Self - Titled is certainly worth a listen, and even 15 years on it seems that the sentiments expressed are still relevant. It is a sound effort, with a consistent theme, solid songs and some interesting arrangements. The CD was recorded and co-produced by Tony Elliott, who did a “brilliant job”, according to Fred. The icing on the cake, for this listener anyway, is the magnificent final track but that shouldn’t get in the way of anyone enjoying the album as a whole. If you can’t get you hands on a copy, you could always try the Mortlock Library!